In 1949, LeRoy Woodward borrowed $2,000 to open a record store in Owensboro, Kentucky and named it the Wax Works. In 1968, LeRoy�s son, Terry, joined his father and two other employees and expanded the retail operation to include wholesale components to accommodate the expanding eight-track tape market. As the retail market began changing from a Mom and Pop concept to a chain concept, the Wax Works developed a music retail chain and named it Disc Jockey. The first Disc Jockey stored was opened in 1978 and eventually expanded to 230 stores located in 37 different states and became the fifth largest retail music chain in the nation. In the late 1970�s, a new entertainment format, video movies, were being introduced to the world and the Wax Works, realizing its potential, aggressively sought and was eventually appointed a national distributor for all of the major film studios. The Disc Jockey music chain was sold in 2000 to Trans World Entertainment. In 2006, the Wax Works started a new company, Team Marketing. It is now the largest holder of licenses for college sports video in the nation. 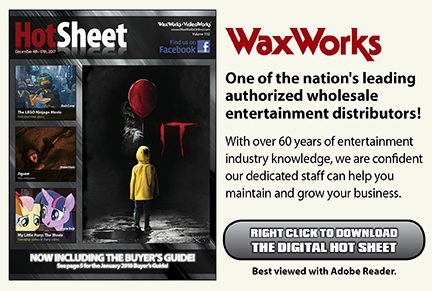 The Wax Works has been involved in the entertainment industry from its inception selling 78 RPM records to today�s high definition Blu-Ray� Discs and every step in between. We understand the challenges of operating a business, we understand retail, we understand marketing, we understand change, we understand the Internet fulfillment business, we understand inventory management � we understand the entertainment business because we have involved for 60 years. Wax Works. We Have the Works. © 2007 WaxWorks, Inc. All Rights Reserved.